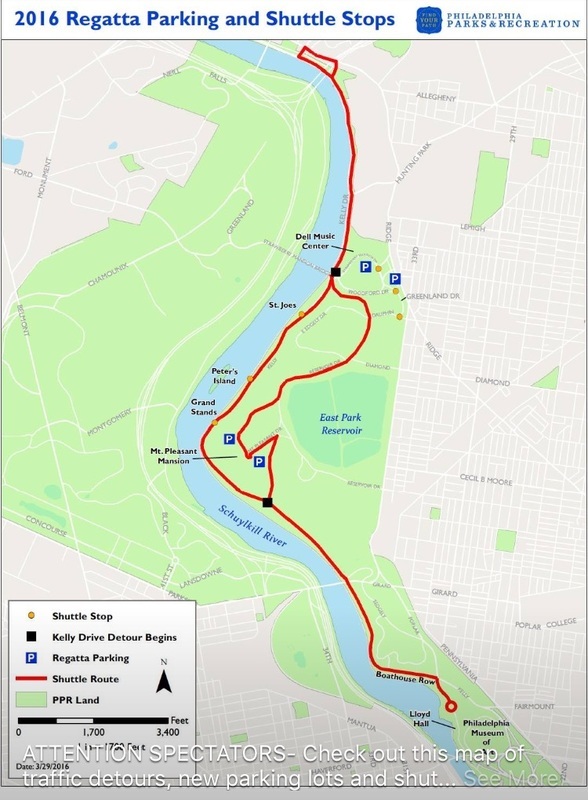 The	river	will	be	on	your	right,	and	you	will	come	to	a	police	roadblock	with	signs	diverting	you	left	off	of	Kelly	Dr.	to	parking	areas	above	the	race	area. At	the	end	of	the	Bridge	stay	towards	the	Center	Left	side Take	the	I676	W	/	US30	W	ramp. Merge	onto	VINE	ST	EXPY	/	I676	W	/	US30	W Follow	the	Signs	to	I76	West	towards	Valley	Forge. Go	to	exit	340A	towards	Kelly	Drive Turn	left	at	the	end	of	the	ramp. Stay	in	the	LEFT	lane	as	you	go	over	the	bridge	across	the	Schuylkill	River. Look	for	sign	on	left	for	Kelly	Drive. The	ramp	will	spiral	downwards	in	a	counterclockwise	direction	and	will	merge	you	onto	Kelly	Drive,	southbound	(switch	to	right	lane	after	merging	at	bottom	of	spiral).